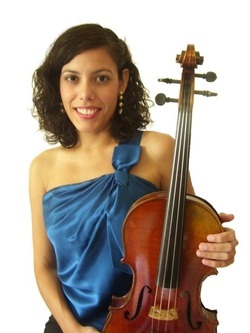 Vivian Torres is a professional violist in South Florida. She obtained her Bachelor’s and Master’s degree in Music Performance from Florida International University. Vivian performs regularly with orchestras and ensembles throughout South Florida and Central America. She has also had the opportunity to perform alongside artists such as Marc Anthony, Usher, Wisil Y Yandel and Seal, in venues such as the Latin Billboards and Premio Lo Nuestro. In addition to performing, Vivian has an equal passion for teaching. She teaches privately and is currently the string clinician for the Robert Morgan String Orchestra Magnet program. She also has a strong passion for New Music and has had much experience performing new works written specifically for her.